Unlike in the US the curtailment of free speech in NZ is shamefully being done by an old Mayor not an 18 year old snowflake who is doing a gender studies degree. Goff legislated in our parliament for goodness sake, enjoyed speaking under privilege the man is a disgrace. The irony that it was an Islamic group given their beliefs that persuaded him into this action is hilarious. I take your point about the hilarious irony here, but would suggest that those in Britain and Europe who are currently living under the Islamic yoke will find the irony less funny. Pray God that this country prevents the issue reaching the point of no longer being funny. It is worth parsing Goff’s infantile, parroted Lefty platitude carefully, as it essentially describes anything from a pub argument to a feisty debate in Parliament as “repugnant”. Really? No prizes for guessing where that sort of attitude will lead if it is not stamped on now. It is not the speech that I would stamp on though – he can say what he likes – it is the abuse of power that acompanies it. 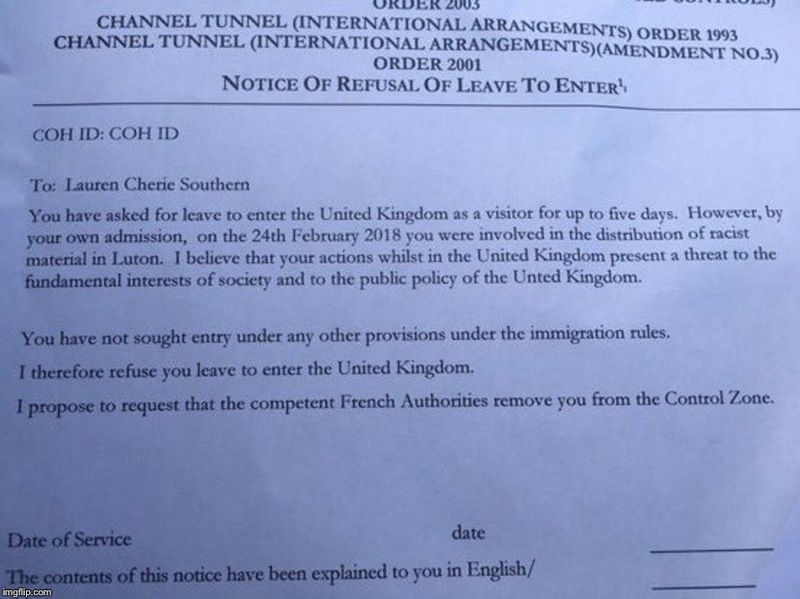 I read the official letter sent to Lauren Southern banning her from entering Britain. It was, not to put too fine a point on it, almost illiterate. It was clearly written by someone with a very poor command of English, and in a style reminiscent of a thirteen-year-old on Facebook. As an official UK Government document it was, in my view, quite disgraceful. Is this the one you were referring to – or something else? Perhaps the fact the letter calls the material racist when no races are implied or mentioned in the material distributed? It’s not a letter, it’s an official notice or notification. It reads like it is in a legally prescribed format required under legislation.. There is nothing unusual about that: similar peremptory-looking notifications are equally prescribed under NZ legislation & unless done that way are challengeable. almost illiterate, clearly written by someone with a very poor command of English, and in a style reminiscent of a thirteen-year-old on Facebook. The material Southern distributed, as far as I know, was insulting to Allah, & it was a silly, theologically incorrect insult. I would have used a more scripturally-accurate one to better effect, & to make the same point with less likelihood of it being able to even be deemed hate speech. I think it very possible that Southern replied to a question, or said something that was, or could be interpreted as agreeing it was “hate speech” (to make the point that Muslims claim insults which are free speech are hate speech – which, in turn, justified the issue of the notice, citing that “admission”. I believe that the whole affair was a stunt, intended to appeal to & grow their low-IQ (& some high-IQ) alt right, far right, libertarian, conservative, & Christian support base, & a visa ban was probably just icing on the cake. I agree with the point she is making about Islam (& some other points she makes on anti-white racism, & anti-male sexism, for example). But these are aimed at much as making her famous, notoious & wealthy as anything else. I even agree with some of the points Molyneux makes – but he is far more sleazy, dishonest operator, basically working a dumber, more credulous audience more for ego, power & money than what he believes in. His schtick is still evolving, & it changes. If the dangers to Western civilisation & culture that large numbers of Muslims represent are to be confronted, the challenges to & accusations against it have to be kept real. I believe it is, and I believe I may have been a bit harsh. But it is not what I would consider a proper formal refusal of entry to a country, particularly the second sentence. And the third, come to that. “involved in the distribution of racist material in Luton” — There is no statute referenced, no broken law quoted, no details of the material itemised, no evidence of anyone affected. This extraordinarily vague charge is quite meaningless. “by your own admission” — I always understood that you could not convict yourself in a civilised country, for which there are very good reasons, as evinced here. “I believe that your actions whilst in the United Kingdom present a threat to the fundamental interests of society and to the public policy of the United Kingdom” — How, exactly? Precisely which ‘fundamental interests of society’ are being threatened? And to which specific item of ‘public policy’ is the unknown letter writer referring? And who exactly is the writer, who “believes” all this? And why are Islamic Hate Preachers and terrorists, who clearly do “present a threat to the fundamental interests of society”, freely allowed in while this girl is thrown out? On re-reading it carefully, I take back my confession to being a bit harsh. I encountered many official letters during my years in England, and they were not written like this: they were invariably precise, detailed, even-handed and unequivocally factual. The only fact I can find in this letter is the date. I stand by my original observation; although I might consider upgrading the thirteen-year-old to 15/16 as the commas are in the right place. It’s not a letter, Sailor. It’s an official notice in a legally prescribed format. It says all it needs to and no more. We don’t know anybody else’s version of what took place when this was served. We don’t know what discussions too place. We don’t what else she was shown or given that may have cited relevant legislation. We see & know only what Southern wants people to see & know. They do have an agenda, but I know a bit about how these things work from the inside. It is very concise and precise and nothing in it can possibly be misunderstood. It is impersonal and has no emotive language or any indication as to the personal opinions of the writer. I’d say that it is an excellent example of how to write such a document. OR – if they show her a clause in a relevant act that describes “racist” that this material might come under, and she agrees it matches that – even if she disagrees it is racist – there is their “admission”. We can’t see the whole document either, and there may be more on the back. Fact is, it’s legal, and done and dusted – unless she appeals to any prescribed authority or a Court. If she did want to re-enter the UK or possibly any EU country now, she should’ve done a wee bit of research of relevant legislation first and been a little more clever how she went about it. Maajid Nawaz talks about this a lot on his radio show. He refers to them as the Alt Right and Control Left, and has a saying Alt Right Ctrl Left Delete, meaning we need to triumph over both groups. This is him talking about the new ‘control’ left. It’s about 4 mins long, but worth a listen, it is from Dec 2016. Khan? Or Majiid – talking to Peterson? There’s nothing wrong with tribalism. It’s can be a defacto family for people who need to be lead. Who are naive or not great thinkers. The trick is ( or should be) to belong to a political tribe but always be prepared to call them out for misdemeanors or straying from what should be philosophical underpinnings for said tribe. Matthew Hooton and Chris Trotter are examples of shamans dishing out unpalatable medicine to their respective tribes. I like that. It helps that I’m not tribal: I’m issues-based. Because political tribes have be ome so adept at saying anything, just fishing for votes & then one never knows whether they will actually operate in either power or Opposition in a way that is completely consistent with what their principles used to be. Well said. sketches some of the difficulties faced by our civilization—a civilization which might be perhaps described as aiming at humaneness and reasonableness, at equality and freedom; a civilization which is still in its infancy, as it were, and which continues to grow in spite of the fact that it has been so often betrayed by so many of the intellectual leaders of mankind. It attempts to show that this civilization has not yet fully recovered from the shock of its birth—the transition from the tribal or ‘closed society’, with its submission to magical forces, to the ‘open society’ which sets free the critical powers of man. It attempts to show that the shock of this transition is one of the factors that have made possible the rise of those reactionary movements which have tried, and still try, to overthrow civilization and to return to tribalism. And it suggests that what we call nowadays totalitarianism belongs to a tradition which is just as old or just as young as our civilization itself.